Subject: Adexec Footwear Application Form. Please find attachment for your APPLICANTS FORM. 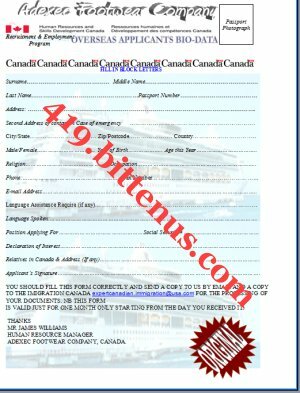 You should print it out, and send a copy back to us, you should read carefully the below Information before filling the form. While filling the form; Applicant must have the following information. B]. In consthen fill and return it to the immigration bureau Ottawa, with the below email address expertcanadian.immigration@usa.com for your visa application to Canada ideration of my employment, I acknowledge that my employment is at will and therefore my employment can be terminated, if I fail to work with time duration according to the working hours of Adexec Footwear. I understand that no representative of Adexec Footwear other than the president has any authority to enter into any agreement for employment for any specified period of time or to make any agreement contrary to the foregoing, and any representations contrary to the foregoing are expressly disavowed, shall not be binding upon Adexec Footwear and should not be relied upon by any prospective or existing employee, unless made in writing and signed by the president. I further acknowledge that any Adexec Footwear personnel manual, handbook, publication, policy, procedure, rule or regulation that may now or in the future apply to me is not contractual in nature and is not intended to modify the foregoing employment relationship.